Usually I’m reluctant to assess the merits of an investment solely on the basis of past shareholder returns. That said, the returns of British pub companies do tend to paint an accurate story. In the previous article on Young & Co’s Brewery I mentioned that it was among the better pub companies alongside Fuller, Smith & Turner (LON: FSTA). A lump sum investment made in the former would have tripled your money over the past decade if you include dividend cash (equivalent to average annual returns of just over 11.5%). Fuller’s has been no slouch either. Its returns of 10% per annum would have turned every £1 invested at the start of the millennium into £5 today. Broadly speaking Fuller’s makes its money in three ways. The first is through the operation of managed pubs and inns, which are properties run directly by employees of the company. The second revenue stream is from its tenanted pubs. These are run by independent landlords who pay rent to Fuller’s as well the tie on alcohol drinks (i.e. they have to buy their pub’s alcohol from Fuller’s). Finally a small portion of total group profit is generated by The Fuller’s Beer Company, which is responsible for brewing well known brands such as London Pride. As it stands the managed properties division generates around 70-75% of total group profit, and within this division the majority of sales (roughly 60%) come from drink. A point I made in the Young’s piece was that beer drinking in pubs faces a grim outlook. The other day I bought a six-pack of Heineken in my local Tesco supermarket for £5.10. Each can contained 330ml of lager for a total purchase volume of 1,980ml. If a pint of beer is roughly 568ml, then the “per-pint” price of my supermarket purchased Heineken was approximately £1.45. Now, just like Young’s the majority of Fuller’s pubs are located in London and the South East. What are the odds of finding a pint of branded lager in a pub in London for anywhere near £1.45? Zero. Indeed I doubt if you could find one for even double that price in London. This, in short, is one of the major reasons why pub companies continue to face such large headwinds. With that in mind you’d be forgiven for assuming that Fuller’s is a company that has struggled to grow profits. The reality, however, is that the underlying business has ticked over nicely. Back in 2010 Fuller’s was throwing off annual revenue of £225 million of which £43 million ended up as EBITDA (earnings before interest, taxes, depreciation and amortisation). Last year the business generated sales of around £390 million with EBITA clocking in at over £70 million. Why has such a grim trading outlook not stopped Fuller’s from growing sales and profits comfortably ahead of inflation? The answer to that question probably lies in the quality of the pub estate. In many ways Fuller’s is like a carbon copy of Young & Co’s in terms of the makeup of its estate. The most obvious similarity is in the geographic concentration – i.e. entirely located in the wealthier parts of London and the South East England. The pubs themselves also tend to be quite upmarket ones (another point I made in the Young’s article). The main points to take away are as follows. 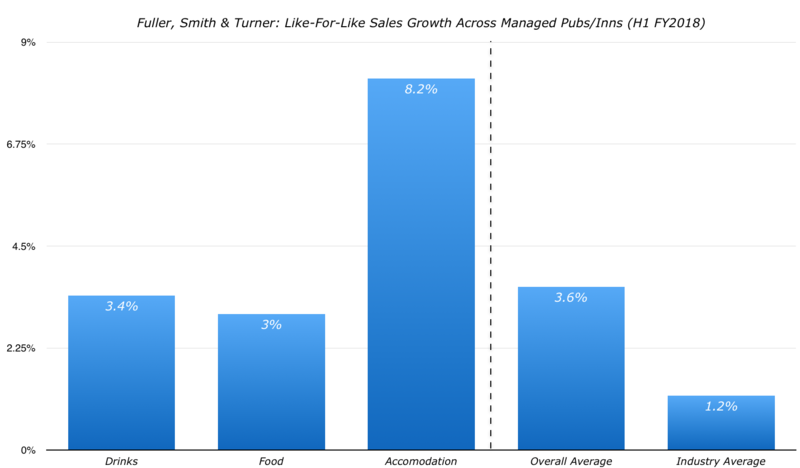 Firstly, upmarket pubs in London and the South East tend to attract patrons with more disposable income (not only residents but tourists too for example). Secondly, wealthier patrons are more able to spend money on the higher margin drink products like spirits and wine. Finally, London and the South East have probably disproportionately benefited in terms of economic growth and certainly in terms of population growth (a good combination for a consumer facing company). Unsurprisingly the upshot of the high quality pub estate is that Fuller’s pubs tend to throw off decent amounts of cash. In fiscal year 2017, for instance, the managed pub division generated total EBITDA of just over £48 million. Spreading that figure over the 198 pubs that made up the managed estate gives us EBITDA per pub of roughly £250,000 – a figure that puts it at the top end of its peer group. According to this piece in the Investors Chronicle the company has raised its dividend in every year since the early-1950s. That is such a remarkable achievement for a pub company that I can scarcely believe it. After all these businesses tend to be capital intensive, debt laden and cyclical businesses; a combination that doesn’t typically lead to multi-decade periods of unbroken dividend growth. How is Fuller’s different? Well, as mentioned above its cash generation is pretty solid. Over the past five years it has generated a cumulative total of around £265 million in cash from its pub/brewing operations. The deprecation bill – which I take as the necessary cash that has to be spent each year in order to maintain sales – came to just under £100 million over the same time frame. That has left plenty of cash to cover expansion capital expenditure, dividends and debt servicing. Secondly, the estate is predominantly freehold (i.e. the land and buildings tend to be owned outright). This gives the company some added flexibility in terms of raising cash from the disposal of underperforming pubs. Finally, the balance sheet is in good health as far as pub companies go. As it stands net the net debt-to-EBITDA ratio is under 3x, saving the company from the kind of dividend sacrifices that certain other pub companies have made. At 15x estimated 2018 earnings you could debate its value at this point in the business cycle. A 6.75% earnings yield and the prospect of low to mid-single digit long-term growth doesn’t seem particularly expensive (nor cheap for that matter). As usual with these kinds of cyclical businesses I think a recession would be a great time to take a closer look.